PARAMUS, NJ — The late Y. Gladys Barsamian (Yerchanig Barsamian) was born in southwest Detroit, Michigan as the first generation Armenian-American in her family. Gladys achieved many amazing accomplishments throughout her life. Gladys passed away in 2016 at the age of 84, her legacy will continue through the establishment of The Honorable Y. Gladys Barsamian Scholarship Fund. Judge Barsamian’s achievements started when she attended Cass Technical High School, which was known as a school of high achievers across the city of Detroit. Gladys became the Valedictorian of her 1950 class. From there Gladys attended Wayne State University where she received her Bachelors of Arts and Juris Doctor Degrees, as one of only six women students. Judge Barsamian practiced law for 17 years. She had a private practice where she specialized in providing legal assistance to immigrants, mostly of Armenian descent, who needed legal advice, but could not afford legal fees. In January of 1975, Judge Barsamian was elected as the first woman on the bench of the Wayne County Probate Court. She was assigned to the Juvenile Division where she served for eighteen years, including serving as Presiding Judge of that Division for six years (from 1982-1987) and Chief Judge Pro Tem for two years (1985-1987). Among her many achievements, Judge Barsamian developed several important initiatives, including: Wayne County Juvenile Justice Plan; Recidivism Predictor Program (cost effective allocation of scarce resources); an Intensive Probation Program; Docket Managements Directives; a Youth Assistance Program; and, established a Citizens Advisory Committee composed of metro Detroit area community leaders. In addition to her Judicial duties, Judge Barsamian served in leadership roles in many professional Legal, Civic and Community Service organizations. Judge Barsamian was on the Board of Directors of Metropolitan Detroit Youth Foundation, Michigan Association for Emotionally Disturbed Children, Downton YMCA, Women’s Economic Club (Past President from 1982-1983), and the Catholic Youth Organization and United Community Services. In 1981 she was honored by the YWCA of Metropolitan Detroit as one of its “Women in Perspective”. In January of 1993, Judge Barsamian retired from the Wayne County Bench. Post retirement, Judge Barsamian had the honor of the Detroit Public School to change its name to, The Y. Gladys Barsamian Preparatory Center. Judge Barsamian was a lifelong member of St John Armenian Apostolic Church in Michigan, a member of the ACYOA Central Council, a Sunday School Teacher, a Choir Member, and served on the Board of the AGBU Alex and Marie Manoogian School in Southfield MI. Judge Barsamian’s legacy will continue through Armenian charities as tribute to her Armenian heritage. 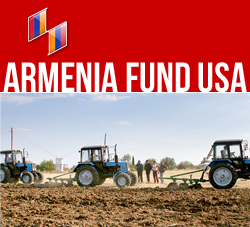 Armenia Fund USA, Eastern Region Affiliate is proud to facilitate the establishment of The Honorable Y. Gladys Scholarship Fund. This annual scholarship will cover 50% of the tuition of two female students in financial need at the American University of Armenia for the next 6 years. These students must be enrolled in the Masters of Law program within AUA and maintain good academic standing. The applications for the scholarship should be submitted to the Office of Financial Aid at AUA, where the Financial Aid Committee will have full control on the selection of recipients based on demonstrated and identified financial need. Students will begin receiving financial aid from the Fund in January 2017.